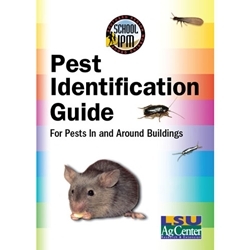 This pocket guide is designed to help you identify pests commonly found in and around buildings. It includes photos and information about various pests, such as ants, roaches, flies, rats, mice, termites, spiders, wasps, bees, bedbugs, fleas, mosquitoes, ticks and more. Diagrams and scales showing the size of some of the pests are included to help in identification. Order 25-49 copies and receive a 25% discount. Order 50-99 copies and receive a 30% discount. Order 100-499 copies and receive a 40% discount. Order 500 or more copies and receive a 50% discount. This discount is not for resellers.